Hanukkah is a spiritual holiday. It is a spiritual holiday in that we rejoice at the Light, at how the upper force sets in within us and separates us from our egoism, or the evil inside us, while we all together wish to connect to this upper force. 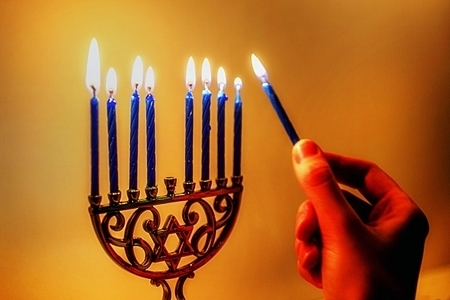 The miracle of Hanukkah signifies the arrival of Hanukkah, the holiday of Light. A small candle ignites within, i.e. bestowal lights up in a tiny part of my enormous egoistic desire. The Maccabees represent the unity among people at a great spiritual height, as one person with one heart. The Maccabees know how to correct their desires for the good of others and for the good of the Creator. The Greeks are the discernments I make within reason, i.e. according to my own intellect, feelings, understanding and all my ideas. A candle is a symbol of the spiritual nature, i.e. of the quality of bestowal. That is why we feel so good and comfortable when it glows. We reveal the spiritual light by the order of the vessels (desires) that descend from above downward, i.e. from a state of bestowal to a state of reception. They are like a chain of candles lit one after the other. The oil symbolizes the Light of Hochma that becomes revealed to us. The wick stands for the discernments we make. – Dr. Michael Laitman, Why Do We Like To Kindle Candles?